This photo might not look like much, but it is a trophy for me in my sporadic camera-trapping — my first ringtail (Bassariscus astutus). Some people call them "ring-tail cats," but they are not in the cat family, although they are a little cat-like. Some years ago a friend was describing a backpacking trip into a wilderness study area in eastern Fremont County, Colo. "I woke up, and there was a skinny raccoon trying to get into my pack!" he said. The Colorado Parks and Wildlife Division's page for ringtails says "most sightings are ne water," which this location is not, being on a slope covered with oak brush, boulders, and scattered pines, but the locale is good for woodrats, and as CPW's page also states, "They are slim enough to hunt woodrats in their dens." 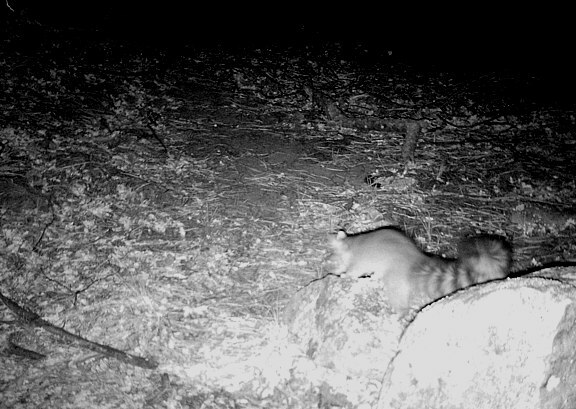 My first goal was to get a photo of a mountain lion — and it is time to take a camera back to that spring — but I was not sure how to proceed with ringtails. Last winter I discovered this "alcove" between a big boulder and a crude dry-stone drift fence that some cowboy(s) worked hard to build decades ago — stone walls are pretty rare in this country. The area is covered with the usual Gambel oak and ponderosa pine. Gray foxes pass through there all the time, along with the occasional turkey and skunk. So I think that I will leave a camera there semi-permanently and see if the ringtails come back. "Most" PEOPLE camp by water, but I have seen m0re ringtail sign in dry places.